We are happy to inform everyone the 3-12-3 FUENTE PROMO has been Extended until Feb. 2008! - 30% DP, in 12 months, 40% balance equal monthly PDC's (Post Dated Check) for 5 years and 30% Upon Turnover of Unit. - Effective up to the end of Feb. 2008! The Ultima Residences Fuente Towers has 28 innovative floors of premier condominium units with a floor area including loft. 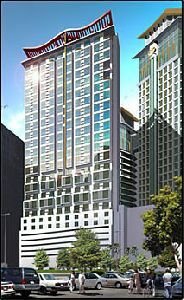 It will feature dramatic foyers, close circuit TV for optimum security monitoring, state of the art automatic generator set for a no brownout guarantee, Hi speed elevator, automatic sprinkler system, internet connection and video intercom from each unit directly to the lobby among its many amenities. The 3 towers - one is the Crown Regency Hotel, a 38 storey Hotel, the Ultima Residences - Fuente Triangle Condo, a 27 story with loft. Two towers will be the tallest tower in Visayas and Mindanao area. Hotel shall operate late 2007 and the condo will be available by 2010 - 2011. Concept : The Residential Condo will be your masters bedroom. The 22 storey facilities and amenties called Club Ultima will be the full living area. The Hotel would then be the guest room. Imagine all this a package. Location. Location. Location. It is "km 0" in Cebu City. Means location is in the heart of Cebu City. For more pictures and further details, contact the web host. Treat your loved ones a present this Valentine's Season! Get a condo unit at Ramos Tower! Absolutely NO DOWNPAYMENT!!! yes..NO DOWNPAYMENT!!! and P12,000/month in payable 4yrs absolutely no interest! !and the remaining thru PAG-IBIG or bank financing. Note: The key to owning a unit is the Club Ultima Membership. Please see Club Ultima ad for details. Where can you find condo unit in the heart of Cebu City - specifically in F. Ramos St. corner Junquera Ext., with a price ranging from Php1.5M approx up to Php 1.8M approx. and Php2.2M to Php3.3M with a world class amenities and facilities? And payment terms of 4 years to pay without interest at 30% DP? Ramos Tower has of it all! Estimated time completion is 2011! ONLY 12,000 PESOS PER MONTH! HIGH LIFE AT A LOW COST! Membership in Club Ultima is the key to owning the premier condominium unit at Ultima Residences - Ramos Tower. - Close to Proximity in the city right in the center of Metro Cebu.Enjoy the luxury of living where schools, dining, entertainment, shopping and business hubs are just ride away. Guaranteed for a value of money. What happened when the Crown Regency Hotel is fully booked? Ramos tower is designed to accept the overflowing influx of Crown Regency, the next Tourist Spot in Cebu City. With a world class facilities in Club Ultima and would be the famous sky bar in the Hotel tower offered at 50USD approximate rate per night, Ramos Tower shall be used to accommodate more guest. Ramos St., beside Diplomat hotel. Enjoy the breathtaking view of Cebu. Live in comfort and style. * Modern architectural style in lush landscaped gardens. * Choice of 2 and 3 bedroom units from 108 to 140 square meters. * Exciting array of facilities with clubhouse, tennis courts, swimming pools, golf putting green and more. Location : Veterans Drive, Nivel Hills, Apas, Cebu City, Cebu Phils. 70% - by bank financing with accredited banks. Floor Area : 102.00 sq. m.